Affectionately known as the “City of Bridges,” Pittsburgh boasts 446 bridges – more than any other city in the world, including Venice, Italy. 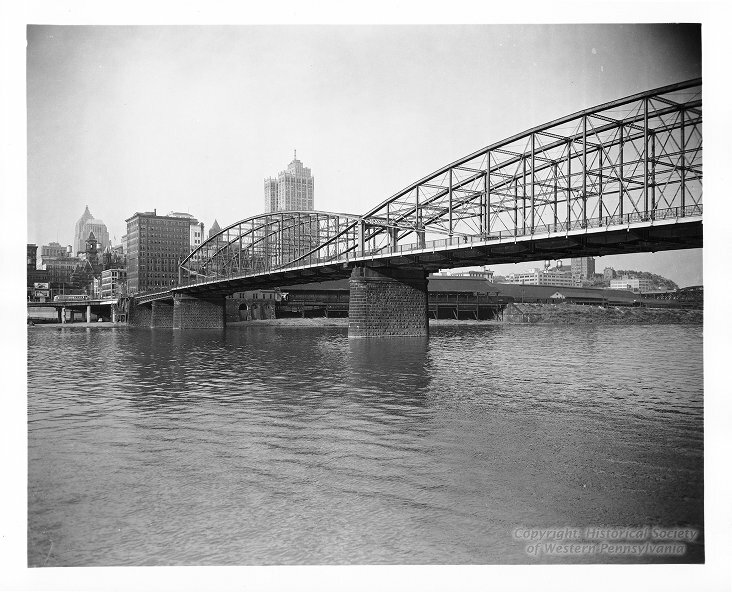 Long before the majestic bridges soared above the Three Rivers, Pittsburgh was a rugged terrain of deep valleys, creeks, and rivers, isolating many of the city’s residents. When the first European settlers arrived in the 1700s, they had to cross streams and climb steep hillsides just to travel around the region. To overcome these challenges, the settlers built wooden bridges to connect newly constructed roadways and span the rivers and valleys. 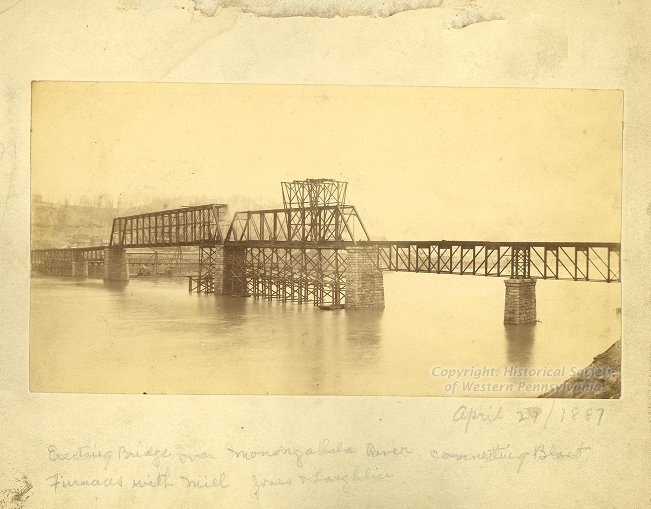 The city’s first river crossing bridge, the Monongahela Bridge, was built in 1818 on the site of what is today the Smithfield Street Bridge. The creator of the Brooklyn Bridge, John Roebling, replaced the wooden structure with a new wire rope suspension bridge, after it was destroyed in the Great Fire of 1845. Increasing weight from additional traffic resulted in its closure and replacement with the modern Smithfield Street Bridge, the oldest steel bridge in the United States. Sixth Street Bridge, March 24, 1917: View of the Sixth Street Bridge from the Bessemer Building in downtown Pittsburgh, spanning the Allegheny River with the North Side in the background. The Sixth Street Bridge (1892-1927) was designed by Theodore Cooper and replaced the second Sixth Street Bridge (1859-1892), designed by John A. Roebling. 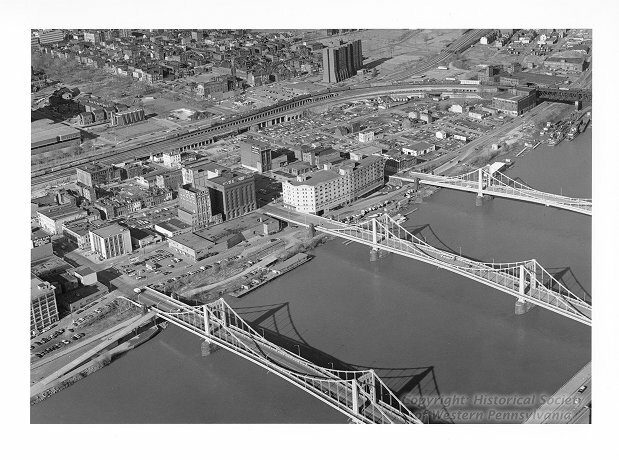 That bridge in turn was replaced by the fourth Sixth Street Bridge, one of the identical “Three Sisters” Bridges (the other two being the Seventh and Ninth Street Bridges). Credit: F. Theodore Wagner, Photographs, Detre Library & Archives at the History Center. 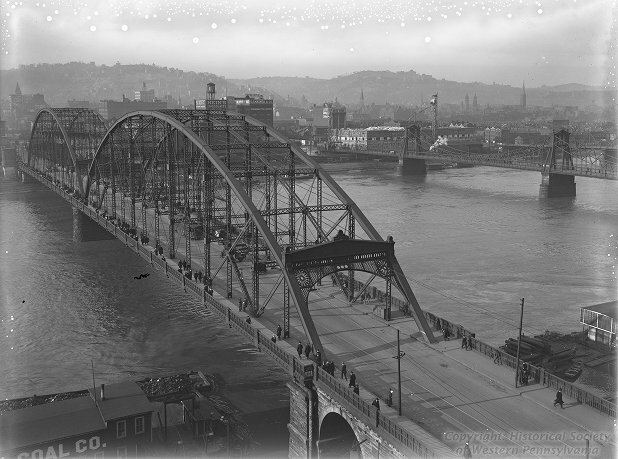 Throughout the 1900s, as the region’s population boomed, Pittsburgh waged a massive road and bridge campaign with the development of the Interstate Highway System. The result was a variety of bridge designs, including suspension, cantilever, and arch, mostly produced from local steel. Most recognizable is the only trio of identical bridges in the world, the Roberto Clemente, Andy Warhol, and Rachel Carson suspension bridges, which carry traffic across the Allegheny River to Pittsburgh’s North Side. These and the hundreds of other Pittsburgh bridges not only connect our region’s neighborhoods and residents, but add to the city’s unique and beautiful skyline. 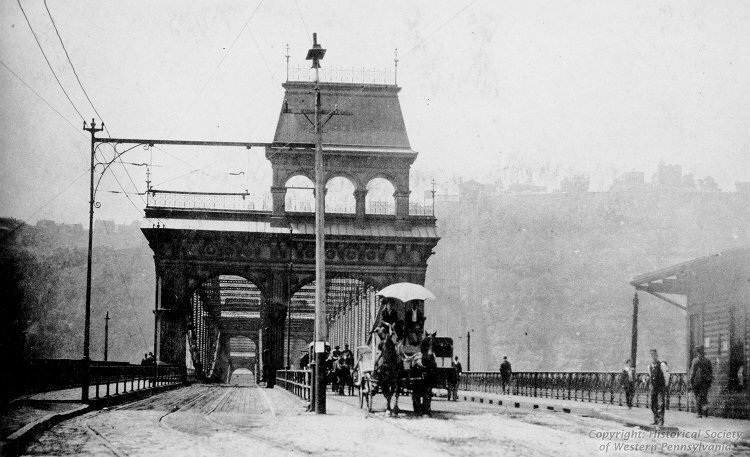 Learn more about the bridges of Pittsburgh in the Pittsburgh: A Tradition of Innovation exhibit. Brady Smith is the Director of Marketing and Communications at the History Center. New York has over 700 bridges, and Hamburg, Germany has over 2000. How can Pittsburgh have the most in the world? great point, though many of the bridges in pittsburgh led to breakthroughs in the construction world, including the Roberto Clamente bridge, which was the first ever self anchored suspension bridge, and one upped your generic suspension bridge. and that my friend, is why pittsburgh is known for its bridges. + thats the state of new york, and germany aint a city. Although what you mention is true, New York is a state and Germany and Hamburg are countries. This article is about the most amount of bridges in a city. Pittsburgh does NOT have the most bridges within city limits, but it’s tough to tell which city has the most. I did some research on this a few years ago (https://nolongerslowblog.blogspot.com/2014/02/what-city-has-most-bridges-and-why-is.html). It’s sad when the History Center posts information that’s easily disprovable – facts matter. But, It’s still fine to call Pittsburgh the “City of Bridges,” because we probably do have the most cross-river car bridges in a fairly limited area.